It’s no secret that I’m a big fan of the Netbook, an emerging new product category of low-cost and ultra-portable notebooks. But it seems many in the PC industry aren’t. Initially targeted at the education market or those wanting a third machine, Netbooks are resonating with a much broader market — and not just because of their lower price point compared to more traditional and higher specced sub-notebooks. Despite years of industry propaganda, consumers are wising up to the fact that they don’t have to step on to the processor upgrade treadmill. Instead, in an age where more and more of our applications and data resides in the cloud (on remote servers, rather than stored locally), a machine with Internet connectivity and one that is powerful enough to run a modern web browser – that’s a Netbook by the way – is often all that we need. This has put the industry on the back foot, reports The New York Times, since the sale of Netbooks produce significantly smaller margins and could unintentionally cannibalize existing and much more profitable product lines. Although the Netbook was pioneered by smaller players such as Asus and Everex who have a lot less to lose, many of the industry’s major PC manufacturers, but not all, have since released or announced their own Netbook efforts, notes the report. Acer, Hewlett-Packard and Dell are in, while Sony and Fujitsu are sitting it out for now. The problem for Fujitsu and Sony, along with companies who have jumped on board, is that the Netbook pie could get pretty big. Market research firm IDC has predicted that the category “could grow from fewer than 500,000 in 2007 to nine million in 2012 as the market for second computers expands in developed economies”, while Intel is being much more bullish. The company estimates that 40 million units will ship a year by 2011, which makes it all the more curious that last week Intel was heard talking down the version of its Atom chip designed specifically to power Netbooks. During a conference call with analysts and the press, Intel CEO Paul Otellini was quoted as saying: “(Atom) is less than a third the performance of our Centrino (processor). 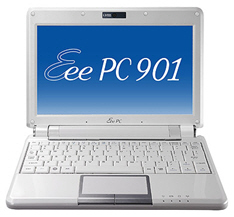 You’re dealing with something that most of us wouldn’t use.” This is from the company who, along with the Taiwan-based Via, has done the most to define the Netbook category. A product it now seems that Intel, along with many in the PC industry, would rather you didn’t buy. It sounds fishy to me as well. Then again, perhaps it’s because the ‘wrong’ people are buying them. I have one, but it’s in addition to my more mainstream equipment. I can see there might be a problem if people buy them instead of more advanced (and expensive) computers… but the mighty computer sellers would know this already. Yes, very fishy. Of course the big companies are not liking this trend, where poeple buy small computers instead of big clunky ones that have way more capabilities than they need. The big companies could have come out with these netbooks years ago, but it took the smaller companies, Acer and Asus to start the ball rolling, and now the big companies are only jumping in to save their market share. I bought a netbook to hold me over while the Sony TT stablilizes and the prices drop a bit. I’m not sure if I am ever going to buy the TT. I have a good home desktop and work desktop. For my occasional business trips, it is fine. I don’t have to put on client shows or anything. It is all I need to check my e-mail, surf, blast out a report, or even watch my home TV via Slingbox. More importantly, I don’t have to guard it like the crown jewels. I encrypted my harddrive with Truecrypt and have done an image backup. I don’t want the machine to get stolen or broken, but it will be a headache (not a heart attack) if it does. I am buying a netbook, given its portability options relative to a notebook. This is going to be the device of the future. I'm shopping for a netbook because my XP notebook is dying. I have a large herd of external devices that aren't Vista compatible, and I am not prepared to throw them all out just because Microsoft wants me to try Vista. I can't find a decent new XP laptop at a decent price, but there are some good looking XP netbooks out there. It's absurd that consumers aren't allowed to buy what they want. The computer industry shouldn't be surprised that people snap up alternative technologies. I think we should buy the computers according to the work that has to be done on them because than only will it be appropriate to use. I plan on getting a netbook being a a University student and a programmer, so having Linux as my main OS on something that can let me take notes, check my email and browse the internet while giving me a fantastic programming environment is perfect. And I can also play Starcraft on it because of how small the requirements are (Wine helps out here too). I think Netbooks are a good second or third computer, as long as you have something powerful as well and not just a netbook.